Josette Bredif, Printed French Fabrics: Toiles de Jouy (New York: Rizzoli, 1989). Exhibition: The Metropolitan Museum of Art, Interwoven Globe: The Worldwide Textile Trade, 1500-1800. Giorgio Riello and Prasannan Parthasarathi, The Spinning World: A Global History of Cotton Textiles, 1200-1850 (Oxford: Oxford University Press, 2009). Metals, spices, and textiles from the Middle and Far East were rare and prized commodities in Europe prior to the 16th century. Exported on land routes controlled by traders who charged exorbitant taxes, the items were expensive to acquire. In the late 15th and 16th centuries, sea-going explorers were determined to find a faster, less problematic route that would make the luxury goods more accessible and affordable. In 1498, Vasco da Gama finally discovered a sea route to India sailing around the southern tip of Africa, launching a race to supply the European market with Indian exports. 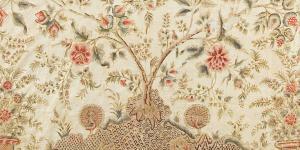 Indian textiles initially were a secondary commodity used to trade for spices. The cotton fabrics, however, quickly became a desirable item when consumers discovered their colorfast designs, easy care, and comfortable wear. As traders brought cotton textiles back to Europe as gifts and curiosities, consumer demand soared. Imagine the reaction from people who typically had only rough linen or wool to wear, patched and repaired repeatedly until the textiles simply wore out! In the 17th century, the trade in printed cotton was among the most important commodities within the global market. Manufacturers in both England and France focused on learning the secrets of Indian dyers throughout the 18th century and eventually began to produce printed cottons of their own. Some Europeans lucky enough to acquire cotton began to integrate it into quilted bedcovers in the 18th century. In England, women adopted a mosaic patchwork technique that often showcased the small floral designs printed on cottons. In France, both whole cloth quilts and framed quilts grew in popularity. As the 19th century dawned, Europeans produced medallion quilts with brightly colored glossy chintz fabrics, whose overall format was influenced by Indian palampores. All of these styles eventually made their way to North America as cosmopolitan colonists imported both expensive cloth and quiltmaking practices. Imported textiles were status items, indicative of one’s wealth and class. As cotton prices went down due to advances in technology that allowed manufacturers to produce cloth domestically, more women were able to take part in the growing craft of quiltmaking and the global textile trade became less significant. Read more about Colonial Quiltmakers?